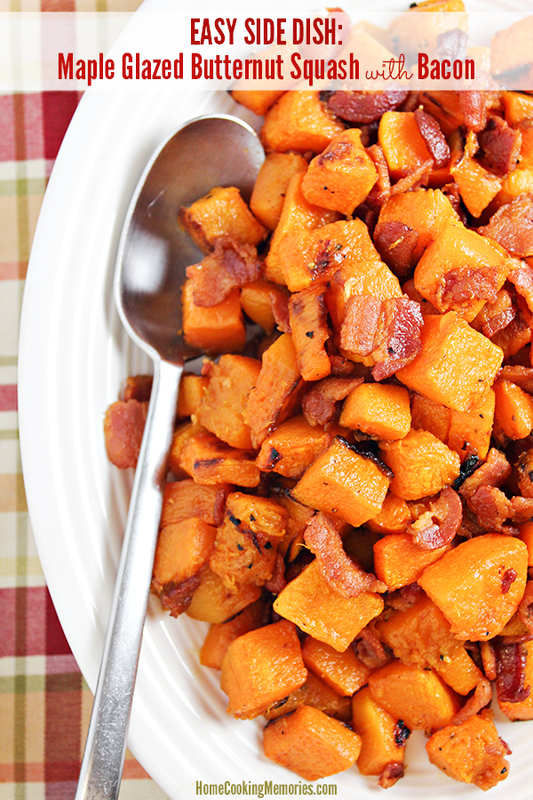 This Maple Glazed Butternut Squash with Bacon recipe makes an easy side dish for dinner. You’ll only need 5 ingredients, including the stars of this recipe: butternut squash, bacon, and maple syrup. 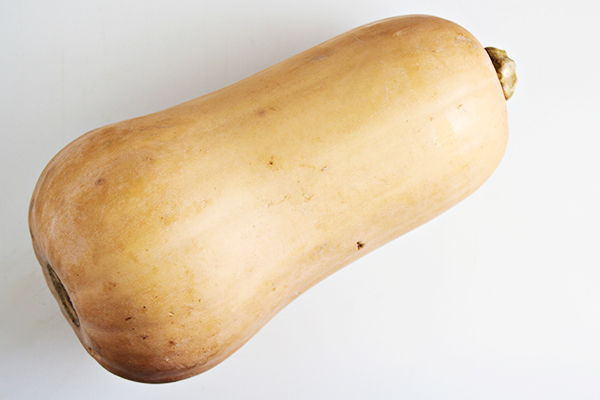 True story: I’ve been completely intimidated by the idea of cooking butternut squash. Until this recipe today, the only time I’ve cooked butternut squash was in 2010 (5 years ago at the date of this post). I’ve avoided it as much as possible and even if I saw a recipe that looks amazing, I would convince myself that it was too much trouble. The silly thing is that I’m a complete opposite when it comes to spaghetti squash. We eat tons of spaghetti squash in the fall and winter. I’m fearless with it, I tell ya. Well, I decided that I wanted that same thing with butternut squash. It was time. I love taking advantage of seasonal produce with lower prices and I don’t want to skip out on this one over some silly fear. A fear that it will be hard to cut open or a fear that it will be hard to cook with. 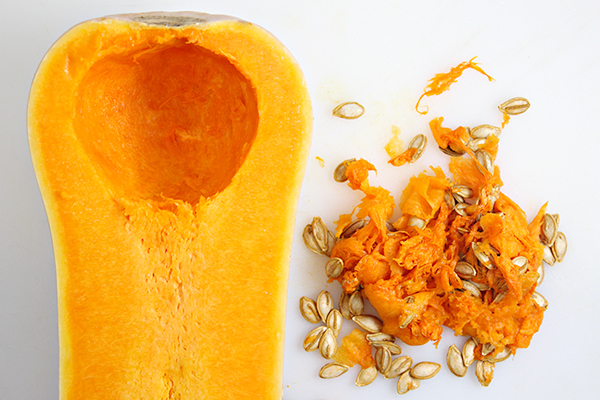 I wanted to create a recipe with butternut squash that would be super simple. I wanted something that I would be likely to make several times this fall. I pulled out The Flavor Bible to see what flavors went well with butternut squash and got busy creating. The final result was so good, so simple, and exactly the kind of recipe I love to share with you all: Maple Glazed Butternut Squash with Bacon recipe. An easy side dish recipe with only 5 ingredients. You’ll want a large butternut squash, about 3 1/2 -4 lbs is good. With a large, sharp knife, carefully cut off about 1 inch of the top and bottom. You can throw those pieces away. With a sharp vegetable peeler, peel off the skin of the butternut squash. 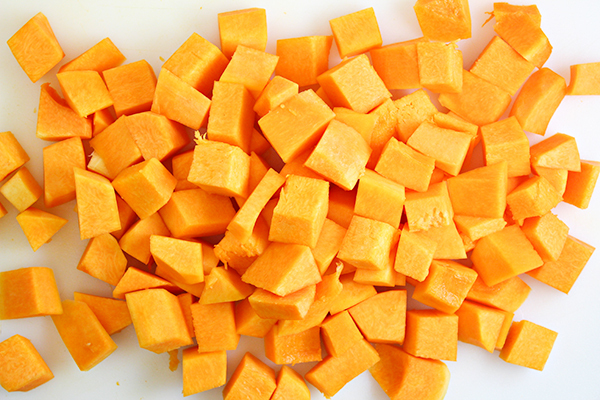 Now, cube your butternut squash into about 1″ pieces. 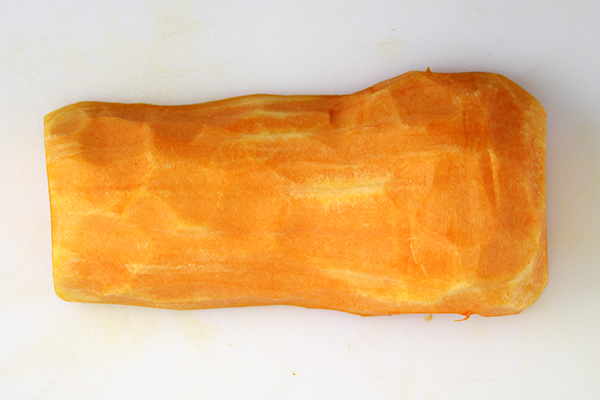 Place the butternut squash onto a greased baking sheet and drizzle with olive oil. Toss the cubes, while on the sheet, to ensure that all the pieces have been lightly coated with the oil. Sprinkle with salt and pepper. Cook in your oven and about 1/2 ways through the cooking time, turn and flip the pieces with a spatula. While the butternut squash is roasting in the oven, you’ll cook your cut bacon pieces on your stovetop. Once it’s done cooking, remove it from the pan with a metal slotted spoon. Reserve about 1 1/2 teaspoons of bacon grease. With the cooked butternut squash still on the baking sheet, drizzle it with maple syrup. Gently turn the pieces to coat all of them with the syrup. Next, combine the squash with the bacon and the reserved bacon grease. Season with salt and pepper and transfer your completed Maple Glazed Butternut Squash with Bacon to a serving plate or bowl. It’s ready to serve! Have leftovers? This recipe also makes a delicious breakfast with fried eggs. Yum! With a large, sharp knife, carefully cut off about 1 inch of the top and bottom; discard pieces. With a spoon, scrape out the seeds and stringy membranes; discard. With a sharp vegetable peeler, peel off the skin of the butternut squash. Cube the butternut squash into about 1″ pieces. 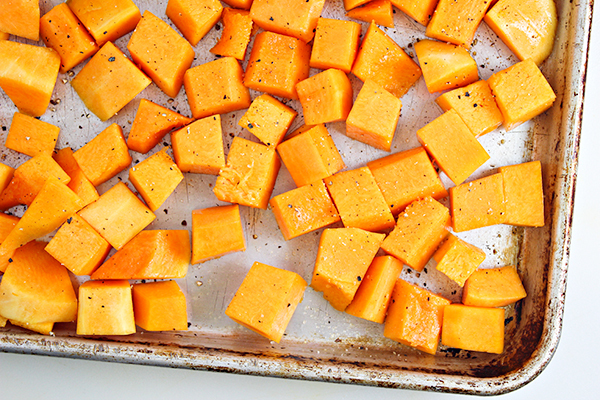 Place the butternut squash onto a large baking sheet and drizzle with olive oil. Toss the cubes, while on the sheet, to ensure that all the pieces have been lightly coated with the oil. Sprinkle with salt and pepper. Cook in in the preheated oven for about 30 minutes or until tender. Turn and flip the pieces over with a metal spatula about 1/2 way through the cooking time. 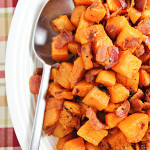 While the butternut squash is roasting in the oven, cut the raw bacon into approximately 1/2″ pieces. Cook in a frying pan, according to package instructions, until fully cooked and crispy. Once the bacon is done cooking, remove the pieces from the pan with a metal slotted spoon to a bowl. Separately reserve about 1 1/2 teaspoons of bacon grease. With the cooked butternut squash still on the baking sheet, drizzle it with maple syrup. Gently flip the pieces to coat them with the syrup. Combine the squash with the bacon and the reserved bacon grease. Season with salt and pepper. Serve. This Maple Glazed Butternut Squash with Bacon recipe is also great for breakfast with a fried egg on top. 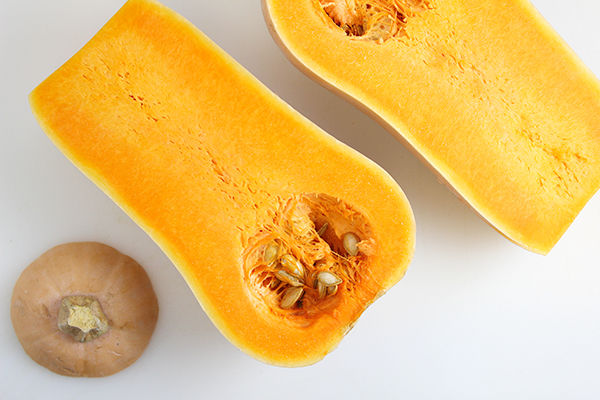 Want even more winter squash recipes? This was wonderful! I used 1 tsp of pure maple cream, and it was fantastic! Definitely a recipe I will make again and again. This is an interesting combination since I used Butternut for thick soups and breads. Thank you ! Looks like so easy to cook and delicious. I pinned at the Pinterest board. Thank you for your participation at Tasty Tuesday Creative K Kids. Isn’t The Flavor Bible the best book? 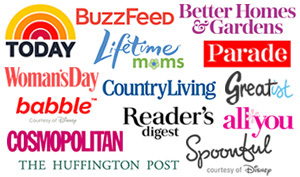 I refer to it often for inspiration and it has never steered me wrong! 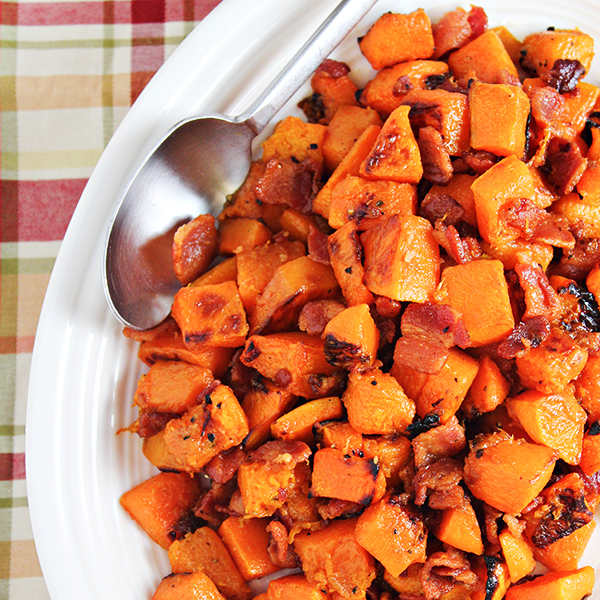 I love butternut squash, and combining it with bacon is such a great idea for a side dish!